injured though 37 of the 250 passengers and the driver of the train required treatment in hospital. the electrical circuit to enable this to happen. in the early hours of the next day. towards the station, easing to level through it. The Up and Down main lines run between their respective platforms. No. 31 lever. These two semaphore signals are 516 yards from the facing points which are 305 yards from the signalbox. The Down starting signals from the Down main and loop lines to the main and branch routes are opposite the signalbox. movement but the machines have a common return wire. the points have moved, the ha1 movement of the facing point lock, to lock the points, opens the normal operating circuit. machines for No. 8 facing and trap points include contacts through the levers of the signals which lead over them. miles towards Portsmouth. The sub-station at Bognor is 2 ½ miles away. There is a track paralleling hut at Yapton. sets and the two coaches of each set were close coupled. type with corridors but without gangways between coaches. 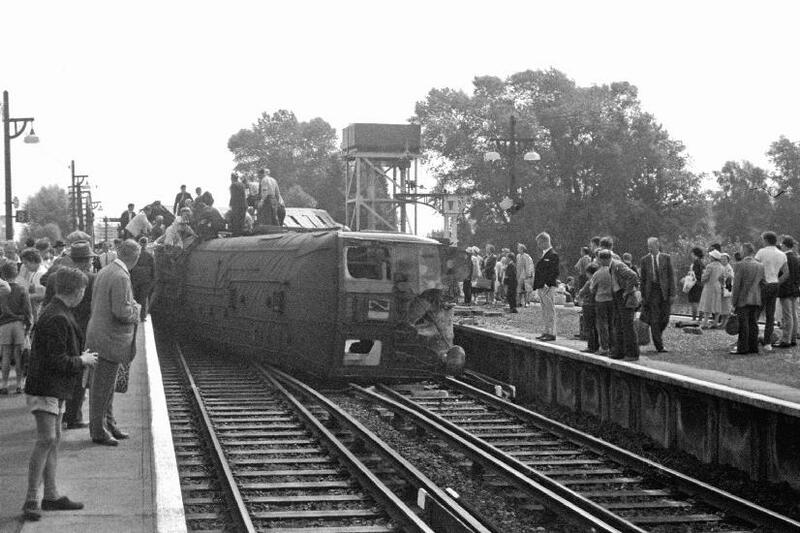 The first coach, a motor one, overturned to the right as the left-hand wheels of the front bogie travelled up the Down platform ramp, and the rear of the coach swung to the right against the Up platform so that the coach came to rest on its side diagonally across both lines between the platforms. It had then travelled 85 yards from the toe of the open switch and 40 yards from the beginning of the platform ramp. The front of the second coach followed the rear of the leading one across to the Up line and it, too, was partly overturned to the right being supported by the platform. 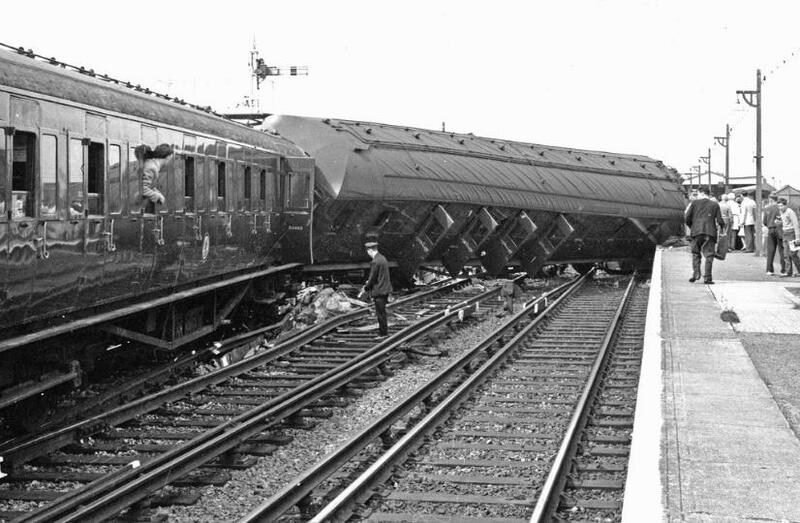 These coaches were extensively damaged both in the underframe and the bogies and in the body; all bogies were separated from the underframes. The right side of the body of the first coach and the roof were scored and distorted by contact with the rails and the Up platform coping, and the compartment partitions were separated from the Boor. They did not collapse, however, and most of the seat frames remained firm. 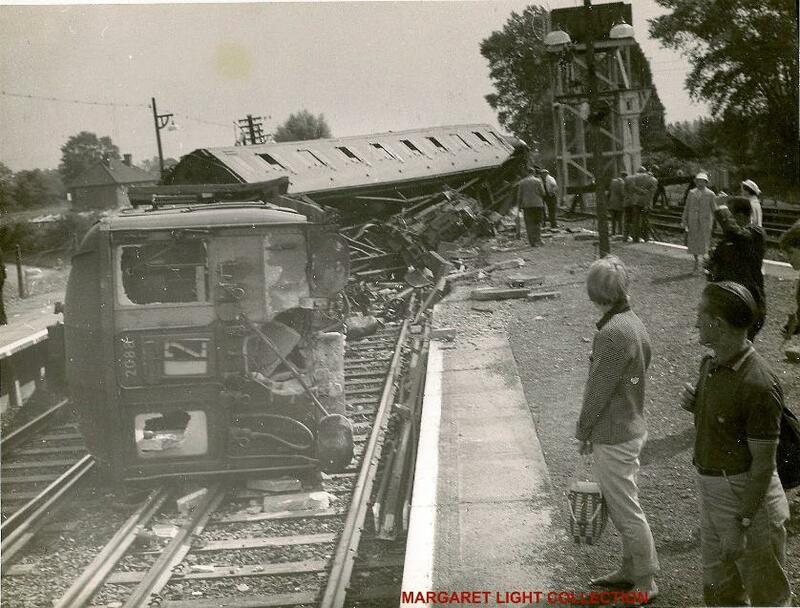 The driving cab of the coach was pierced by two of the Down platform concrete coping slabs, one of which then fell across the cab as the coach overturned. Fortunately, the driver held momentarily to his position on the left of the cab and fell on top of the slab and was not injured by it. 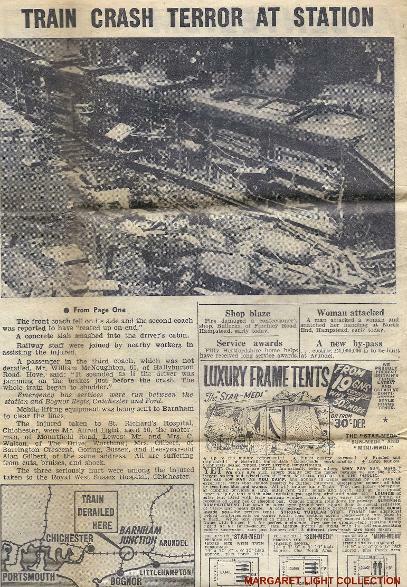 The interior of the second coach also retained its shape well so that passengers were not crushed. The rear four coaches were not derailed and damage to them was slight. 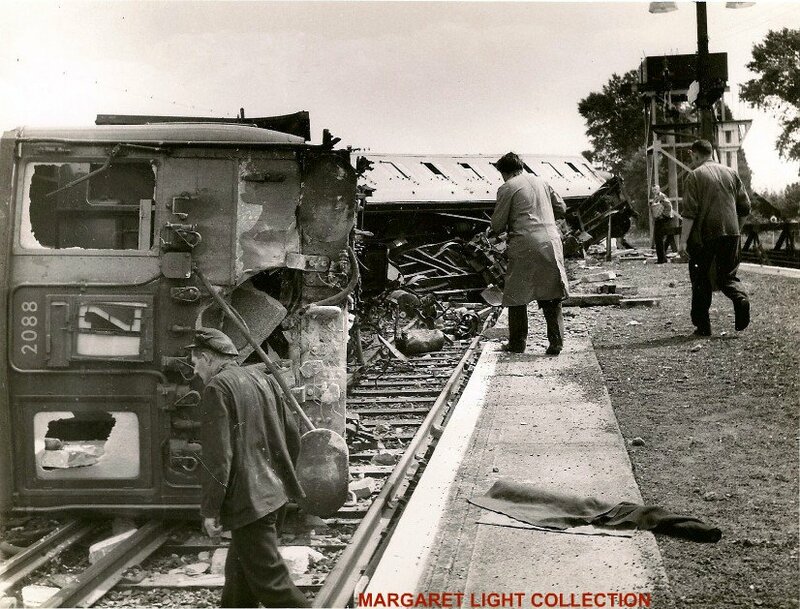 The accident caused moderate damage to the track and conductor rail over a short length, and the Down island platform ramp was demolished. The coping stones and faces of both platforms required some repair. 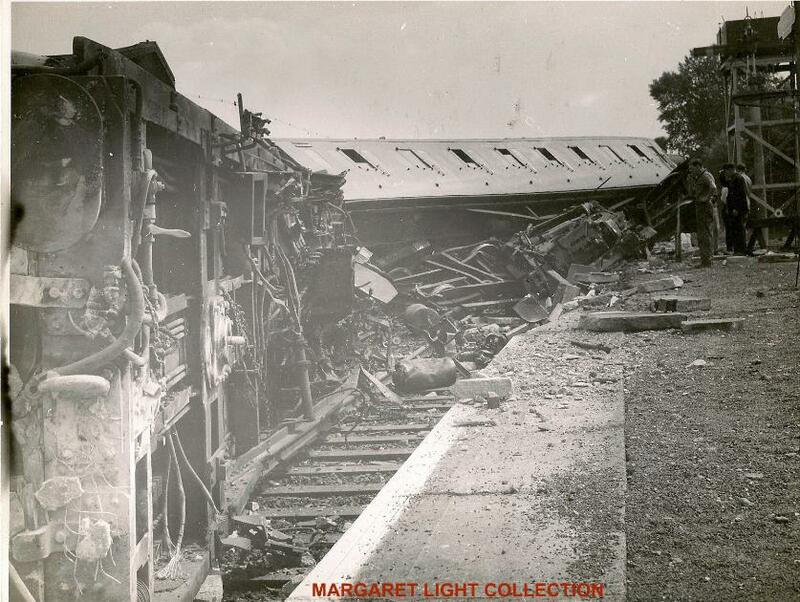 The signalling and point operating equipment was unharmed. Barnham. Subsequent energisations of line were made in accordance with the requirements of the Operating Department. received "Train Entering Section" from Yapton at 11.0 a.m.; he was not able, however, to lower the Home signal No. recorded the time of the accident as 11.3 a.m.
said that it slipped his mind as he became very busy in reporting to Electrical Control and Traffic Control at Redhill. in the frame; the points had not moved to the normal position until the contacts had been adjusted. relieved at Barnham and had come to the scene, to the staff room. that traction pressure had been removed. He did not recollect any heavy application of brakes before the violent bump. 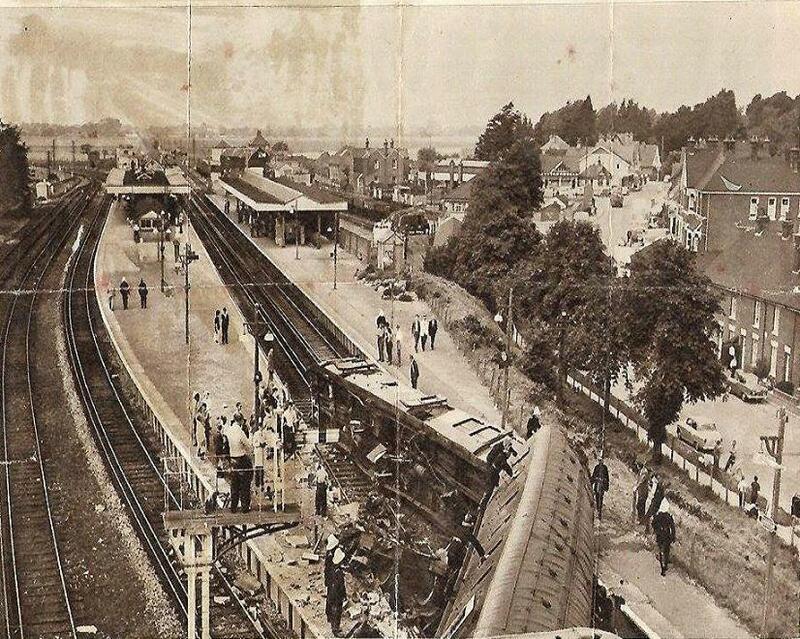 and arranged for the passengers to be conducted on foot to Barnham; this he said was completed by 11.50 am. was against the wheel flange of the fifth coach. but he thought that the motor was trying to restore the points to normal. the signal had been put hack to Danger. He then inspected the coupled trap points on the loop which he saw were normal. 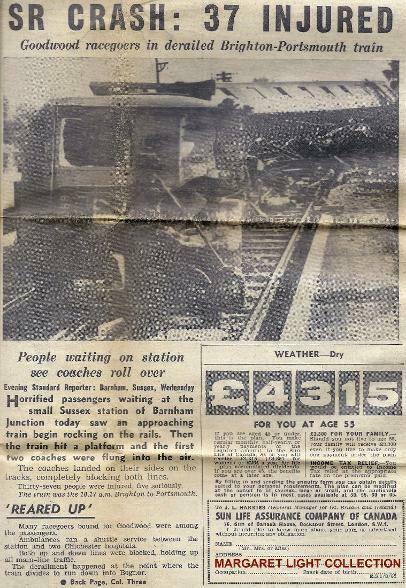 was a varying voltage of between 5 and 15 volts which coincided with the starting of trains from the loop platform line. reverse operating wire and the return wire. and the holding down screw underneath was to connect the wire to the running rail via the locking frame and the rodding. condition was undoubtedly the cause of the points moving on this occasion. found it when it first fell, if they had suspected that it had fallen on to the wires under the controller. return or earth was approximately the same. points from a start at the home signal 516 yards away, though it could have achieved a speed of 38 m.p.h. in that distance. driver momentarily to leave the driving position. circuit was completed and the motor was energised to work the points to normal, which the sub-Inspector heard. Department to emphasise the consequences that can arise from the smallest mistake in signal equipment maintenance. extraneous electrical pressures; nevertheless, in this case a breakdown in insulation at a critical point made it vulnerable. additional protection within the next six months to one year.